Courageous starts off with a bang: Nathan Hayes has just moved back to his hometown of Albany, Georgia when a simple stop for gas turns into a carjacking. Nathan’s not about to let the thieves get away—he leaps onto the truck, dangling from the driver’s door like Indiana Jones as the carjackers speed away. Without thought for his own safety, Nathan risks life and limb to save not his truck, but his young son tucked into a car seat in the back. It’s a terrific beginning. Unfortunately, it’s all pretty much downhill from there. If I had to describe Courageous in one word, it would be “wholesome.” Randy Alcorn is to be commended for taking a formulaic story (from the screenplay by Fireproof creators Alex & Stephen Kendrick) and turning it into a readable book. He has a nice ear for dialogue and his descriptions build clear mental pictures. He’s even good at making the preachy parts palatable. Be advised, there are plenty of sermons tucked in these pages on topics ranging from the dangers of drug abuse to “true love waits” to anti-abortion activism and more. It’s not the messages themselves that’s the problem, it the “been there, seen that” aspect of it all. There’s just nothing new here. Here’s the story in a nutshell: crime-fighting dads (they work in the sheriff’s department) realize that being a dad is scarier than taking down bad guys. They band together in an accountability program—which actually sounds terrific, by the way—and go on to become better fathers. 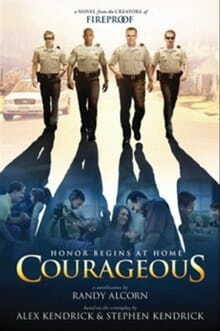 As the tag line says, “Honor begins at home.” No quarrel with that here; it’s just all so Lifetime movie of the week. The guys get their acts together, their kids respond exactly the way they should, and they all live happily ever after. Oh, there’s one dad who gets busted for doing something he shouldn’t and suffers the consequences, but even that worn-out plot device can’t freshen up this story. It’s a fairy tale for fathers, designed to hit every emotional button. Our cast is carefully assembled—black guy who made something of himself after growing up on the wrong side of town, likeable and hardworking white guys, and a poor but honest Hispanic immigrant. There’s even that staple of southern police shows, the big-bellied Bubba who throws his considerable weight around in pursuit of what he considers justice. There’s the daughter who may be falling for the wrong boy, the son heading down the wrong path, the new hire at Headquarters who’s making deputies’ lives miserable, the unforeseen tragedy that strikes close to home . . . we’ve seen it all before in countless movies and TV shows. It’s a testament to Alcorn’s skill that he makes these stock characters and situations almost believable. The movie version of Courageous will be in theaters this fall. Despite its failings, if the book that shares its name helps men become better fathers then it’s worth reading through a little déjà vu.